Testing SCR using a multimeter. A multimeter can be used to test SCRs quite effectively. The first procedure is to check the diode action between the gate and cathode terminals of the SCR. This test is just like what you have done in the case of testing a silicon diode (see testing a silicon diode). Now put the multimeter selector switch in a high resistance position. Connect the positive lead of multimeter to the anode of SCR and negative lead to the cathode. The multimeter will show an open circuit. Now reverse the connections and the multimeter will again show an open circuit. Then connect the anode and gate terminals of the SCR to the positive lead of multimeter and cathode to the negative lead. The multimeter will show a low resistance indicating the switch ON of SCR. Now carefully remove the gate terminal from the anode and again the multimeter will show a low resistance reading indicating the latching condition. Here the multimeter battery supplies the holding current for the triac. If all of the above tests are positive we can assume the SCR to be working fine. This is another method for testing an SCR. Almost all types of SCR can be checked using this circuit. The circuit is just a simple arrangement for demonstrating the basic switching action of an SCR. Connect the SCR to the circuit as shown in diagram and switch S2 ON. The lamp must not glow. Now press the push button switch S1 ON and you can see the lamp glowing indicating the switch ON of SCR. The lamp will remain ON even if the push button S1 is released (indicates the latching).If the above checks are positive then we can conclude that the SCR is fine. 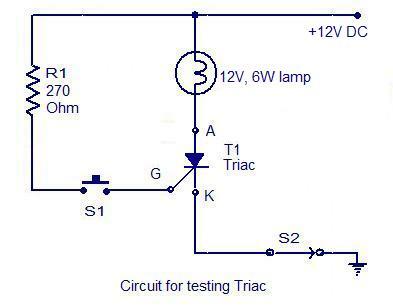 An scr is not a triac. Its a great projetc… i think it will help me a lot. i had subscribed today.. i am a Student of E&C in Delhi.. Please update me daily with this type of articles. 1. test K-G for diode response. 2. connect A to +, K to -. Test for high res. 3. connect A to +, K to -. Test for high res. Steps 2 & 3 are the same. Your test procedure is wrong. plz accept me in your webside and send me all new information to my email . I think that 270 ohms is too small and would blow up the gate at 12 V on some SCRs. Plus an SCR is not a triac. I have a CR6CM-12 which only draws 0.015 amps at the gate. The gate on mine is maximum 6v. 8v is too much. plz what is the meaning of S2,also in test of SCR where can i wired the (-12) the second pole of Dc. Switch S2 can be used bring back the SCR from the latching state.